TEKCamp 2011 kicked off yesterday at Vobster Quay in brilliant sunshine. The inaugural event saw divers travelling from as far afield as Ireland, Germany and Egypt to take part in a week of solid diving fun, skills and lectures. Judging by the grins of TEKCampees as they surfaced from their first dive, the journey was well worth it. 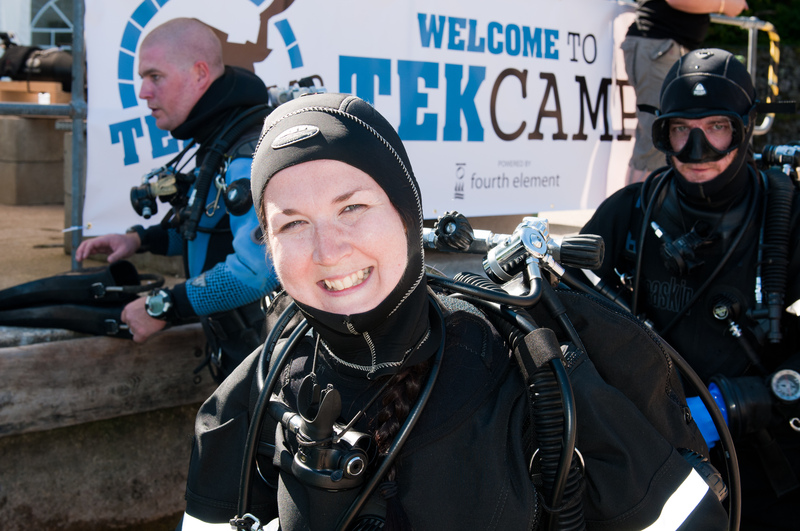 “I thought I could dive and then I came to TEKCamp”, said Trudy Nicolle, a qualified tec diver from the Isle of Wight. “I’ve had all my equipment reconfigured, lost 4kg and my position in the water is better and everything is easier. We’re diving the Gods this week, it’s amazing! Being able to interact, ask questions face to face and spend quality time with them, picking their brains. They’re all so helpful. I came with an open mind expecting to leave using 10% of what I gained over the week and was very happy with that idea. It’s not even day two and I know I’ll use 90% of what I’m learning. It’s lots of little details – even down to which hand I use to hold my light”. “The nice thing about this event is that the Instructional team have the perfect opportunity to fine tune each individual’s core skills”, stated Martin Stanton, Vobster Quay’s Managing Director. “None of the divers attending TEKCamp are ‘bad divers’ – and in fact a third of them are diving professionals. They’ve grabbed this unique bespoke coaching opportunity and they’re making the most of it to get their skills polished. Since this is not a formal training course it allows the Instructional Team to pay attention to the nuances, and therefore take the TEKCampees to their personal next level by adjusting small details and strategically tweaking each diver’s performance. Subtle changes make such a difference and the TEKCampees are climbing out with a greater awareness of their body position and immediate surroundings. You can see this in their face – they’re more comfy in the water, far more relaxed and they’re climbing out bouncing and happy”. Next PostNext Is this the Best Job in the World?